Across the United States, companies producing the goods and services that we rely on in our daily lives all have one thing in common - use of hydraulic power for production capabilities. Every day, the kind of products and services this business provides touches the lives of every American in many different ways - from a hydraulic hose on a garbage truck to the steerage of ocean liners, from power steering and air-conditioning hoses in the family car to the boilers of steel-producing industries, from steam cleaning to chemical processing and mining, from elevators in high-rise buildings to harvesting and transporting grain and cattle, from mowing the golf course to earth moving and from construction to the processing and packaging of food. When the hose critical to the process fails, companies face downtime that costs them hundreds, even thousands, of dollars each hour. This franchise is the world's leading service provider in on-site hose replacement. The franchises turn key system gives the franchise owner the opportunity to open their doors on the first day of business with a fully equipped service center. Interested buyers must supply their full name, address, email address and phone number. Buyers must have a minimum net worth of $500K. 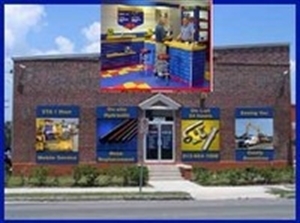 Location and Facilities: Business typically operates from a retail Center with approximately 2,500-3,500 square feet. The franchises turn key system gives the franchise owner the opportunity to open their doors on the first day of business with a fully equipped service center. Lots of upside potential in sales while building significant equity for future exit strategy. The Franchise has great financing plans that will help you finance up to 80% of your Center. A prospective franchisee should have liquid capital resources of at least $125,000.